So, when Melissa over at the Elegant Rose boutique contacted me about reviewing her soaps, I was initially reluctant, after having a look at the ingredient listing on her page. Well, turns out I was at least a bit mistaken, she had completely reformulated her soap, this time not falling into the whole “slight alterations to a hand soap” trap that so many artisan soap makers do when they want to branch out into shaving soap. She just didn’t have it up on her website for sale at that point; now she does. And the product that she did provide to me is pretty darned good. Latherwise, it’s a reasonably thirsty soap. Not quite as much needed as, say, Mike’s Naturals or Barrister and Mann, but you’re definitely going to want to add a small splash when lathering to help develop it. It’s too finnicky, so absolute precision isn’t a worry here. It develops into a nice thick lather with pretty good glide, although perhaps not quite what I’d say is great glide. After the shave, it leaves the face feeling nice and moisturized, smooth, etc. I’d imagine that’s in no small part due to the kokum and shea butter? Anyways, it’s good stuff; she obviously actually did her research and tested thoroughly. And, as a bonus, it smells nicely too! The woodland spice is, well, pretty much exactly like what it sounds like, a woodsy scent combined with spicy notes, most notably the cloves and the cinnamon. With some sweetness too, from orange and probably at least some influence just from the kokum and shea butter in the soap itself. A very deep invigorating scent, great for the winter months. As far as soaps go, it’s not too shabby in the strength department; once lathered up and applied to the face it presents itself rather noticeably, with only some fading during the course of a pass. I think it’s reasonable to give this one a 9/10. I’m really glad that she managed to reformulate her soap with this much success! Cost: As mentioned, I was provided this soap sample for the purposes of this review. 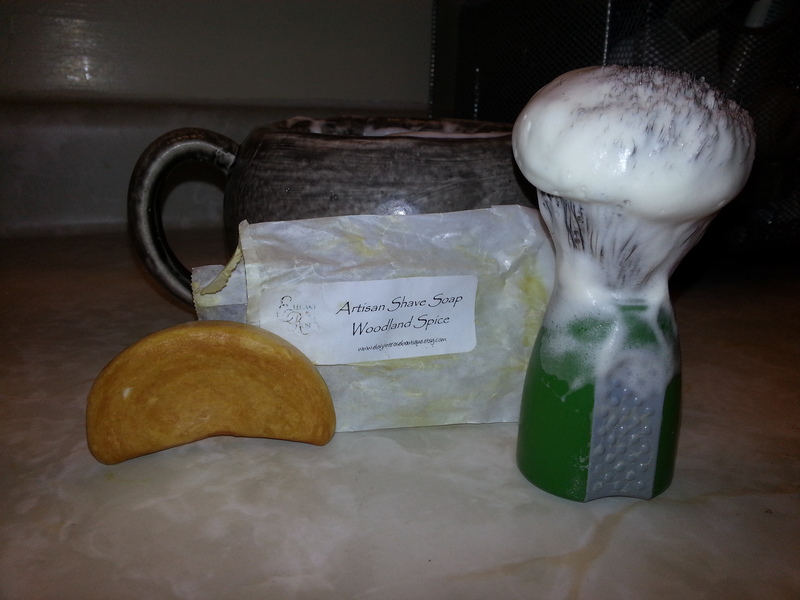 Pucks of the soap can be obtained from the Elegant Rose website, for 14.95 per 4 oz. Just keep in mind that this review is valid only for their artisan shaving soap. As well, Melissa provided a coupon code “Shave” which could get you 10% off your order until April 24th. Ingredients: Saponified Oils of vegetable stearic acid, organic shea butter, kokum butter, organic palm oil, avocado oil, coconut oil, castor oil, apricot kernel oil, organic jojoba oil and essential oils. Ok, so I’ve been lazy lately. Sorry about that. During this time, I’ve been using almost exclusively this soap, which I’ve had forever and just hadn’t gotten around to reviewing. So, suffice it to say at least, I’ve got a pretty good idea of how much I like this soap, having tested it for about 4 months straight. Which isn’t to say that I’m necessarily going to have all that much more to say about it mind you. The scent is supposed to be mandarin, and for that, I suppose that it fits reasonably well enough. It’s a sweet vaguely orange-y scent. I think I also catch a bit of the Shea butter as well, one of those ingredients in the actual soap that you can still sometimes actually get a whiff of. It’s a somewhat weak scent. Just strong enough that you can notice it during the shave, if you’re paying attention. Not strong enough to command your attention if you’re not. As for the shave itself, it’s rather good. It has a very wide range for the amount of water that you can use and still get a good shave. Using just a bit more than a moist brush will do a passable job, add more and you get a good balance of glide and thickness, keep adding water and it thins out only gradually. It never does get to quite what I’d consider to be an ideal balance of the two, mind you, but still overall, I’d say it’s a really good soap. The moisturization is about average for a typical commercial product. I probably rounded up on the lather quality above, but I’m going to have to round down for the overall due to the weakness of the scent. 7/10. Cost: I had purchased this from Fendrihan, where a refill goes for $26.50, or you can purchase it with the bowl for $39. Ingredients: Potassium Palmate, Sodium Palmate, Potassium Stearate, Potassium Palm Kernelate, Glycerin, Water, Sodium Stearate, Sodium Palm Kernelate, Fragrance, Palm Kernel Acid, Shea Butter, Cocamide DEA, Pentasodium Pentetate, Tetrasodium Etidronate, FD&C Yellow 5 Al Lake (CL 19140), D&C Red 7 (CL 15850), D&C Yellow 10 Al Lake (CL 47005), Limonene, Citral, Hydroxycintronellal, Citronellol, Geraniol. So this is a follow up on my latest review. That one was the unscented version of Arturro Barbiere’s shaving soap, which I thought was quite nice for an unscented soap. 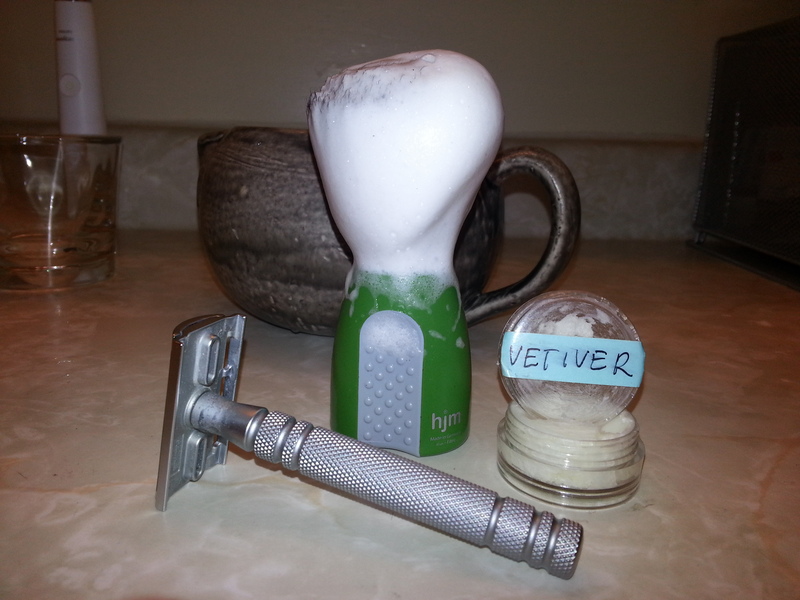 Here we have the Vetiver version of the shaving soap. The vetiver is a quite pleasant scent; it has the nice deep earthy scent that I think of when I think of vetiver (which I’ve only ever really encountered in shaving soaps mind you), as well as perhaps a very slight bit of a fresh green note that I haven’t noticed in many other vetiver scented products. It was strong enough that it was noticeable throughout the shave, but I definitely would have preferred if it had a bit more “oomph” to it. As for the performance of the soap itself, as far as I could tell it was identical to the unscented version. Which shouldn’t exactly be a shock to anyone. Relatively soft, it has a nice wide sweet spot with regards to the amount of water you can use and still get a good shave out of. Works reasonably well with very little, but does improve if you add it to what I would consider to be a moderate amount of soap. You don’t need a lot, but you’re probably not going to be able to accidentally overshoot it all that much. All in all, a good balance of lubrication and protection, and good moisturization properties to boot. All said, I’m going to give it an 8/10. 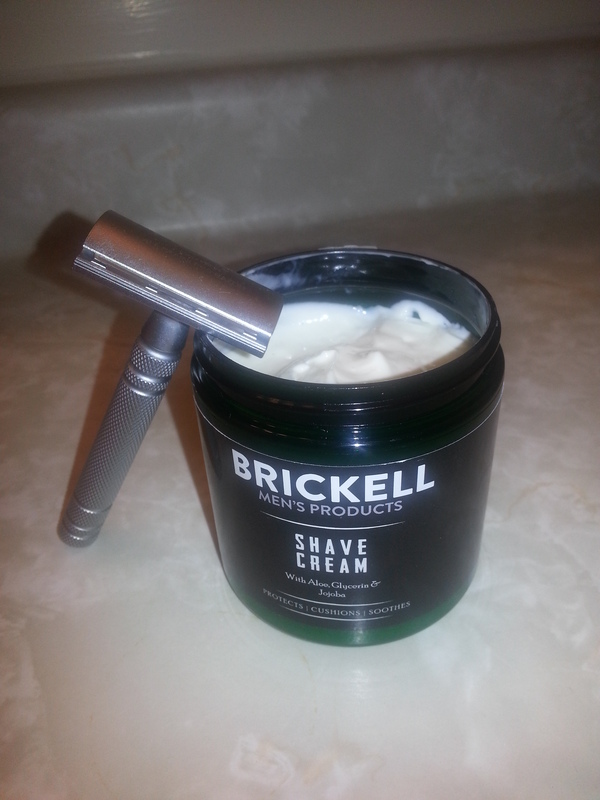 It provided a very pleasant shave, although I definitely would have liked it better if it was a bit stronger. Cost: They come in either a 100g plastic tub for about $9 USD or a 150g tin for around $12 USD, depending upon the exchange rate at the time. Purchases are made either via e-mail at arturrobarbiere@interia.eu, or via the contact form on his website. Ingredients: coconut oil, stearic acid, vegetable glycerin, distilled water, shea butter, beeswax, potassium hydroxide, natural fragrance oil. I was contacted by Artur, the fellow behind the polish Arturro Barbier line of soaps about doing a review. So, he sent off a pair of soaps, their Vetiver scented one (which I’ll be covering in a few days), and this unscented “Purile” soap. The soap is relatively soft. It reminds me a lot of Wickham Shaving Soap, both in appearance and consistency and performance. Like the Wickham, I found it had a relatively wide sweet spot. It would work reasonably well with just the water on a moistened brush, but the performance did improve when a moderate amount of water was added to the mix. It didn’t seem easy to over-shoot the amount needed. It provides a very good balance of glide and thickness, and left my skin feeling soft and moisturized as well. 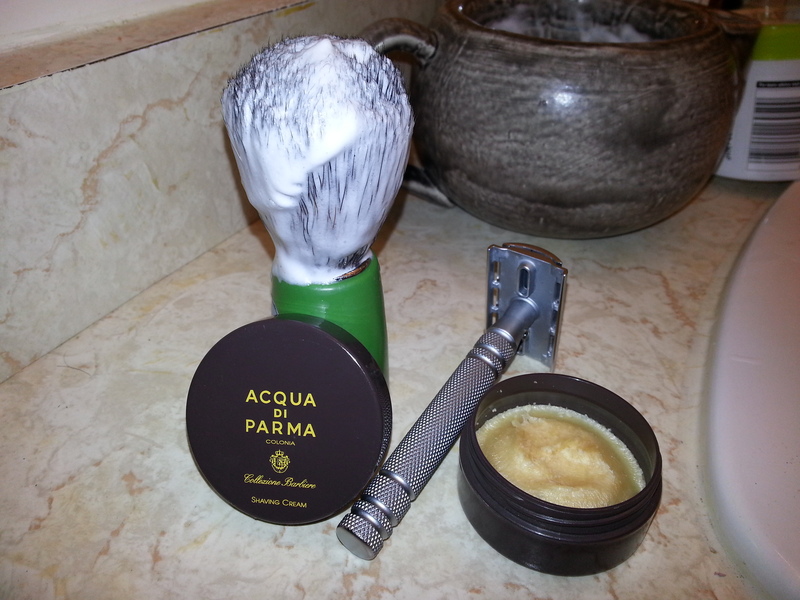 All in all, a pretty damned good shave. So, it’s a pretty good soap for an unscented. Those of you who follow my reviews with any regularity will know that I consider the scent to be a rather important part of the overall shave process. The scent of this soap is, well, extremely neutral. It doesn’t smell of much at all, which I suppose is the point. Sometimes even with unscented stuff you can make out what ingredients went into it, but I didn’t really find that to be the case here. So, if you’re specifically looking for an unscented soap, I’d definitely recommend that. If not, obviously I wouldn’t. Overall, taking the unscented-ness into account, I think I’ll have to give it a 6/10, because after all, it’s not something that I’d go out of my way to use when there’s scented products available. That having been said, I’ll be reviewing the Vetiver version in a couple of days, and I’m sure it’ll fare better. My first impression of Erasmic’s shaving stick was that it was too brittle to be sold in this format. Like many shave sticks, it comes with a little plastic holder that has four prongs, onto which you are to impale the shaving stick. Anyways, one I removed the wrapper and went to reimpale the stick on the prongs, the soap broke off in chunks, preventing the holder from actually, you know, holding the soap. Far too brittle to be sold in this format. 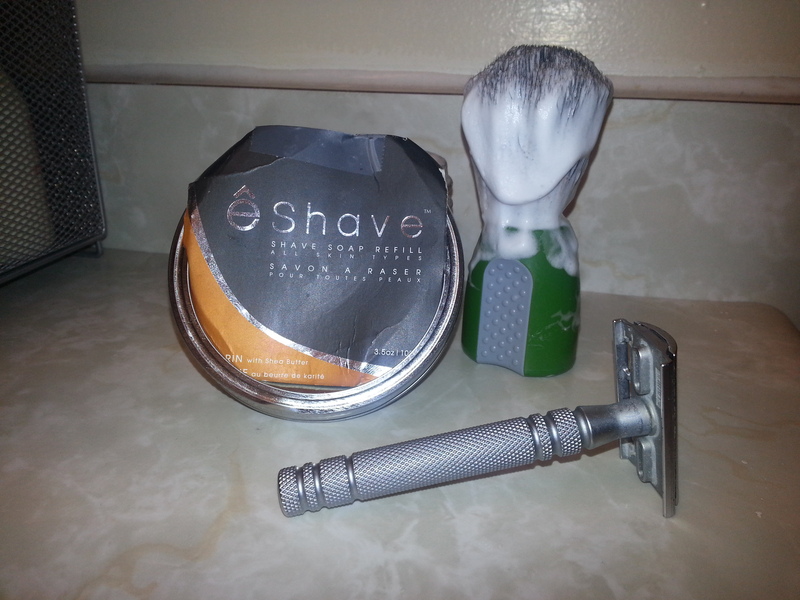 The soap performed… well, pretty much exactly like the Derby shaving stick that I reviewed a while back. Good balance of glide and thickness once you dial in the right amount of water to use (not too much, be careful of adding too much between passes, not too little). A bit finnicky, but it was good stability-wise. No real noticable moisturization or other skin benefits however. The scent was slightly less unpleasant. I wouldn’t say I like it, it was still a very artificial aroma, cloyingly floral. It was however also not very strong at all. Quite discernible when sniffing the stick directly, but not really noticeable at all when shaving. Overall, meh. 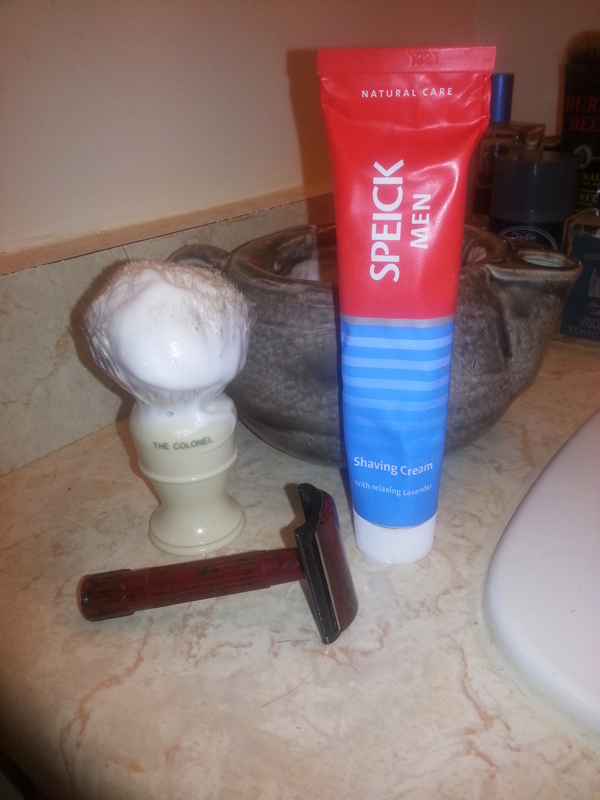 The scent did nothing for me, the shave was good but not great. 6/10. 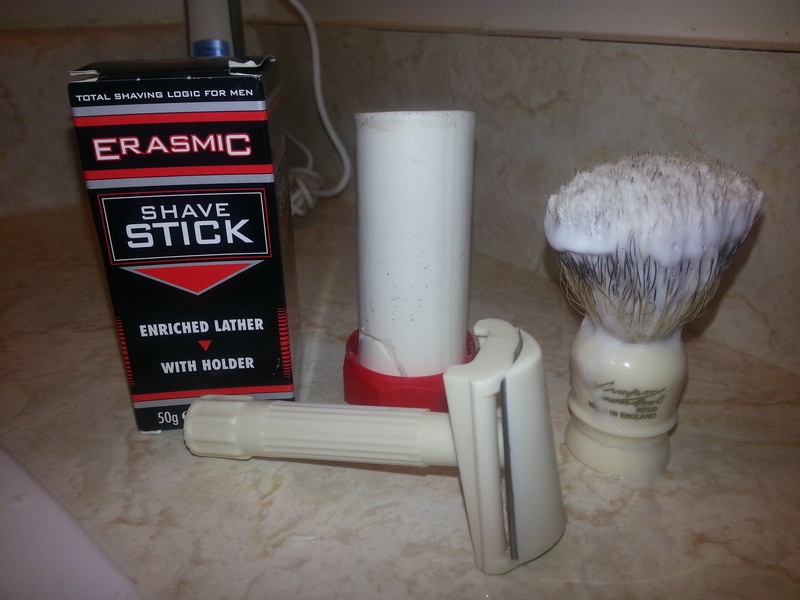 Cost: Connaught Shaving sells two of the 50 g sticks for £2.40. They also have a 75g version that comes in a plastic tub, for £3.00. Ingredients: Sodium Tallowate, Sodium Palm Kernelate, Aqua, Potassium Stearate, Sodium Stearate, Potassium Cocoate, Sodium Cocoate, Glycerin, Parfum, Cinnamyl Alcohol, Citral, Citronellol, Coumarin, Geraniol, Limonene, Linalool, Titanium Dioxide, Sodium Chloride, PEG-14M, Tetrasodium EDTA, Sodium Gluconate, Sodium Silicate, Magnesium Sulfate, Tetrasodium Etidronate. Despite its name, “Russian Tea” is an American invention, or at least the mix of tea, oranges, cloves, and cinnamon upon which this scent is based is, where it’s most popular as a Christmastime drink in the Southeast. Strop Shoppe specifies that it’s a combination of orange, clove, and other spices. Those two scents are definitely quite noticeable in the mix, as well as a cinnamon-y note as well. I didn’t really notice much in the way of tea, however. Overall, it’s a sweet spicy concoction, which I found to be rather pleasant. And the strength level of the scent is pretty much ideal for me. 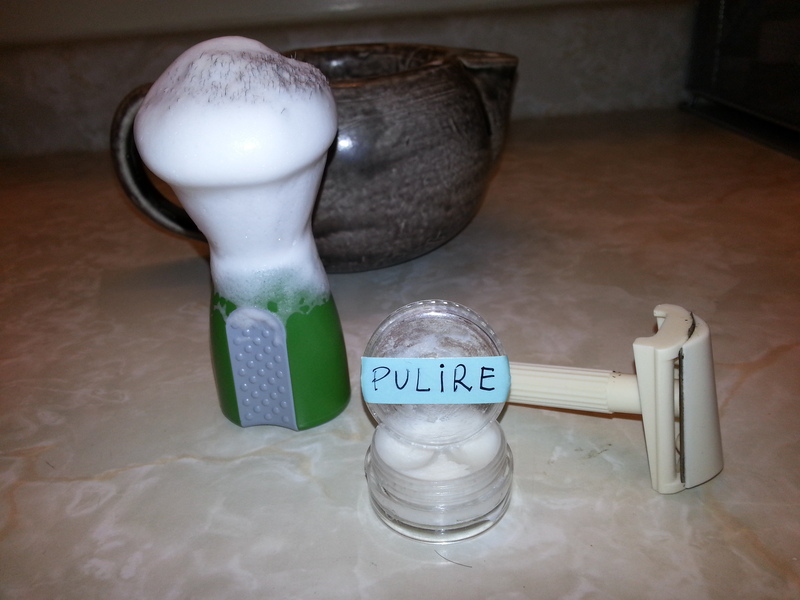 Nice and strong, without any noticeable fading while you shave. 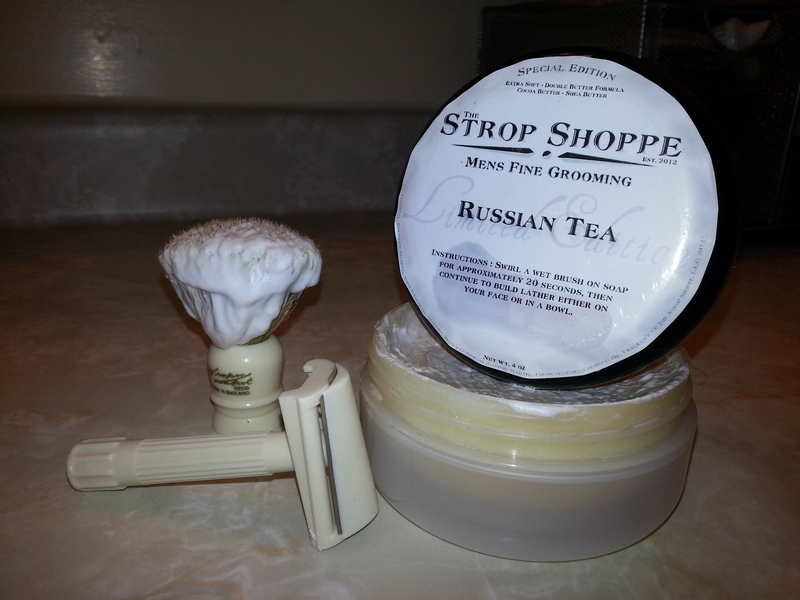 The performance is excellent, as expected from one of the Strop Shoppe’s special edition soaps. 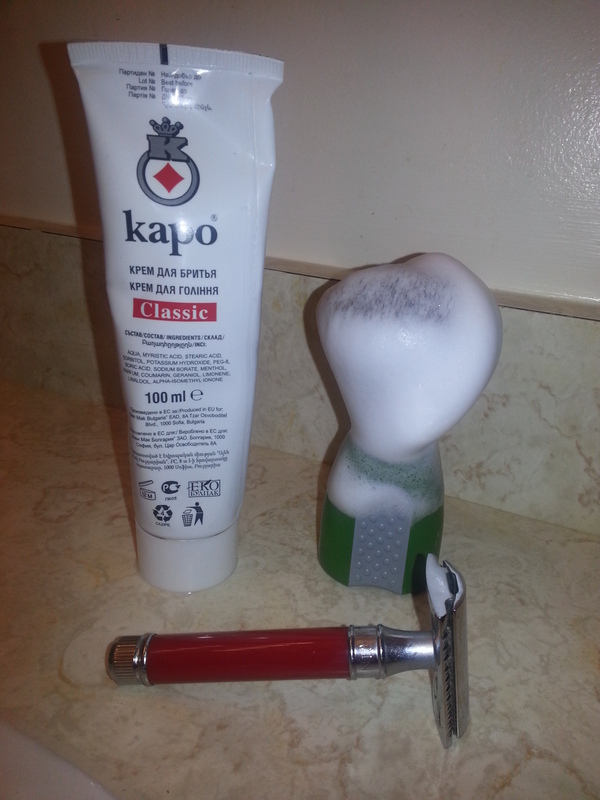 It lathers up easily, very thick with a great amount of glide as well. And some great moisturization properties to boot. I do however have to mention the inconsistency on the labeling. Again. The label listing of ingredients doesn’t list the cocoa butter or shea butter that another part of the label specifies it has in the “double butter formula”. Also, this soap can’t seem to figure out if it’s the special edition or the limited edition, as both are on the label. I seriously hope that I stop having to see labeling inconsistencies when dealing with the Strop Shoppe in the future. It’s irksome. Frankly, they don’t seem to be getting any better at this whatsoever. For example, on their website, the “Limited Edition – Vivace with Tallow & Lanolin” doesn’t have any lanolin at all in the ingredient listing. Edit: So, apparently the newer style of the labels for the special edition Russian tea had the labelling fixed. And they’ve since fixed the issues with the ingredient listing on their website for the Limited Editions. So, I think I’ll be giving this a 9/10. A very nice soap. Cost: I think this was probably actually the Limited edition, as it’s in the 4 oz tub instead of the 6 oz tub that the special editions seem to come in. But the limited edition doesn’t currently seem to be in stock; the special edition version is however, at $18.99 for a 6 oz tub. Ingredients: Potassium Stearate, Sodium Stearate, Glycerin, Castor Seed oil, Coconut Oil, Fragrance. As mentioned above, I don’t think that’s accurate.